A Malaga court ruled that Arenal 2000 must give Suzan and Malcolm Windle, 68, a free home. 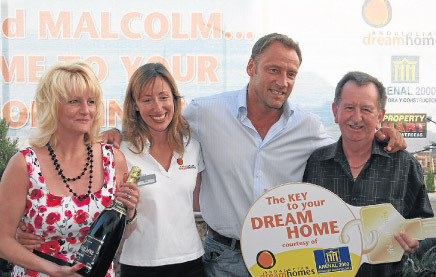 The case dates back to 2006 when the couple were ‘over the moon’ to be told they had won a ‘buy-one-get-one-free’ competition for a new apartment worth €250,000 in Benalmadena. The couple from Yorkshire entered the competition with agent Andalucia Dream Homes when they bought their current home in Isla Redonda, near Sevilla. But the dream soon turned into a nightmare. “It is like being told you have won the lottery and then you haven’t,” explained Suzan, 54, whose picture was even used by the company for marketing their win on billboards along the N340. “We were over the moon when we won; and planned to rent it and use it as a holiday home,” she told the Olive Press. During this time the two companies involved, Andalucia Dream Homes, which is now in liquidation, and Arenal 2000, owned by disgraced businessman Rafael Gomez Sandokan, both blamed each other. “It has been six years of hell and stress as we have been passed from pillar to post,” added Suzan, who praised the work of her lawyer Roberto Leiro from Lawbird. “It is finally excellent news. As Arenal no longer owns the apartment we are either going to get another apartment or financial compensation. This entry was posted in In the Media and tagged Lawbird, Roberto Leiro on July 21, 2012 by admin.